Though unsympathetic to Nazi ideology, Heinz Lüning thought he had found a way to avoid being drafted into the Germany army by becoming a spy for Hitler's Abwehr intelligence agency. 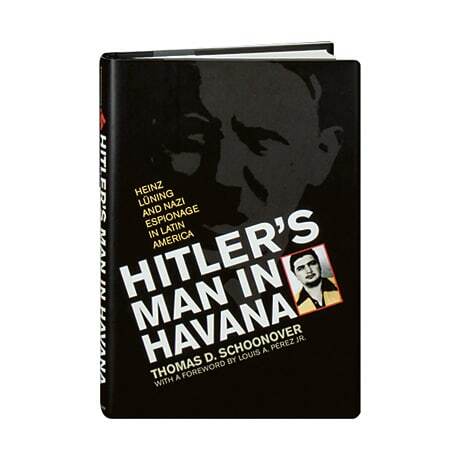 Posing as a Jewish refugee in Cuba, he was dropped into a hothouse of espionage that included J. Edgar Hoover's FBI operatives, British intelligence agents under Graham Greene, and Ernest Hemingway's private club of sub spotters. Yet Lüning was poorly trained and inept at spycraft; learning little worth reporting, unable to build a working radio, and improperly mixing his secret inks, he was discovered by British postal censors and executed by a Caribbean firing squad. For U.S. and Cuban officials, however, Lüning's capture was touted as a major intelligence coup. The author of eight books, including Uncle Sam's War of 1898 and the Origins of Globalization, The Banana Men, and Germany in Central America, Thomas Schoonover tracks Lüning's activities in a narrative filled with atmospheric details, revealing the political upheavals of the time and explaining the broader trends in the region and in local counterespionage, while speculating on how Lüning may have inspired Greene's hero in Our Man in Havana.